Happy Heart of Gold Day!! You don’t know what Heart of Gold Day is? 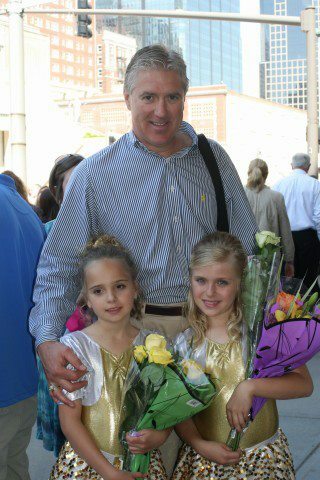 No worries, it’s not an official holiday, but it is a very special day for my girls (Alex & Kylee) & me & I love that I can share it with YOU, because if you observe Heart of Gold Day, it will make your day better—guaranteed! And who knows? It could make all your days to follow better, so join us in celebrating Heart of Gold Day. Heart of Gold Day is in honor of my beloved late husband & the best dad in the entire world, Steve Corbin. Today is his birthday! Happy Birthday, Big Guy! Six years ago, we lost the love of our lives, but also 6 years ago we decided that even though he is not here with us physically, we will celebrate the marks he made on our hearts. We started a foundation to continue his legacy—the Stephen Corbin Heart of Gold Foundation---to help kids in need play sports; hence, Heart of Gold Day on his birthday. Today, to help define what Heart of Gold Day really means, I’m sharing what I wrote in 2012, the first birthday that he was gone. This was probably my first true writing about our grief journey, which led me here to this blog & The YOU Revolution. 1. Call a friend that you haven’t talked to in a while and catch up on his/her life. Don’t email or text; take the time to call to show you truly care & to make a real connection again. 2. Introduce yourself to someone you don’t know well and strike up a conversation. Who knows, you might find a new friend? 3. Play with your kids as if you were 8-years-old. In 2012, the girls and I went to the water park all day. I didn’t watch them go down the slides; I raced them to the bottom! 4. Love your spouse with your whole heart. Tell them why you married them and let them know why you love them today. If only I could do #4; however, I still remember Steve’s words from exactly 1 year ago (now 6 years ago) and they warm my heart. Words can last a lifetime, so make them good. 5. Smile a big smile all day and make peoples’ days better. We will always remember Steve’s BIG smile and how good he made us feel. “People will remember how you made them feel”. 6. Donate or volunteer! The girls and I are working on creating a foundation in Steve’s honor, but until it’s established (ACCOMPLISHED! ), there are many organizations that need your help. We are donating clothes and toys to a local shelter. 52 (now 58) years ago, the world gained one great man! Steve lived every day making this a better place and there is no doubt that he made a positive impact during his lifetime. He did this by making habits of the six items above and then some. As much as I miss Steve, I must work daily to make this world a better place like he did. Tomorrow is not guaranteed, so you must make your mark today! It’s your birthday, Stevo, and I love you with all my heart! Thanks for all the marks you left on our hearts! Olive juice, my big guy, olive juice forever! !